Jennifer's card was a clear one with a snowman on the front, and she had run the front of the card through an embossing folder and her Cuttlebug. Very pretty! But I wanted to make one with Close To My Heart stuff, of course! AND I wanted to show you the shaving cream technique with reinkers. A bit messy, but very fun. Plus, I LOVE the stamp set All Decked Out. The snowman pieces are great, and you can change his hat, scarf and body parts. So this is a clear plastic card (which you can't tell from the picture). 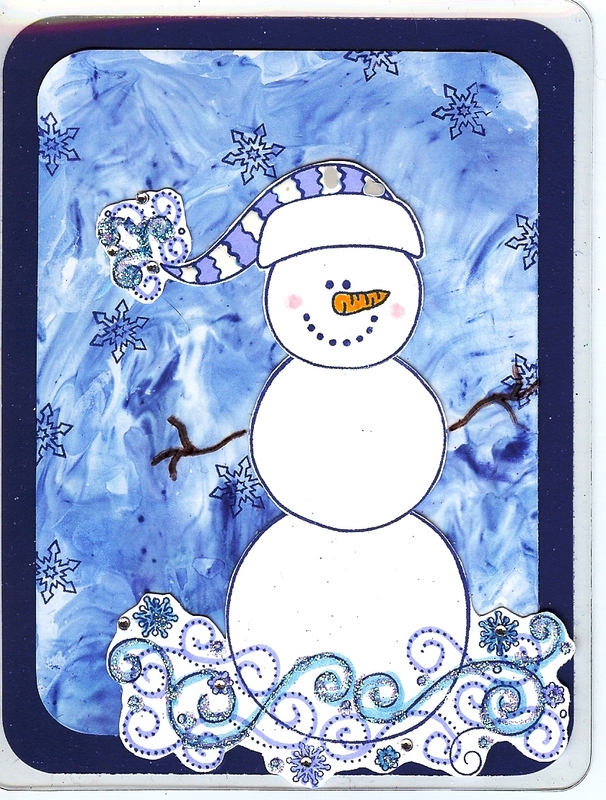 The snowman is on the front of the card, the blue swirlies are on the inside front of the card, and the dark blue (Moonstruck) is on the back of the card. DON'T FORGET: Peel the plastic protective sheets off BOTH sides of the plastic card before you start. I made the swirlies with a plate full of shaving cream (any kind - use the cheap kind from the dollar store) and some Crystal Blue and Moonstruck Reinkers. Lay a sheet of paper on the shaving cream, making sure you press the card into the shaving cream. Wipe it off with a paper towel. Let dry. Repeat with other blank sheets of paper (for extras). You will get different patterns as your shaving cream gets moved around. You can even spread it on your sheet with a knife. 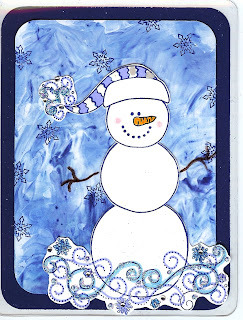 I rounded the edges, stamped a few snowflakes and attached the swirly paper to the INSIDE of the card. 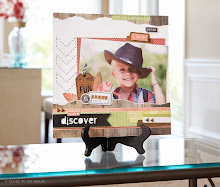 TIP: The adhesive I used on this card was Tombow or Liquid Glass. You can also use double stick tape. You do not want to used glue stick. It will get dry and un-stick. With the Liquid Glass, I held the paper down for a few minutes, to make sure it was good and stuck. Also, be careful, it squishes out, if you put too much on. I debated between Crystal Blue, Sky and Lilac Mist for the swirls. I decided on Sky and Lilac Mist. Then I added Bitty Sparkles, Liquid Glass and Prisma Glitter. LOVE that bling! I also added Liquid Applique to his hat, between sections of Lilac Mist. Fun Flock would also be a nice addition. I stamped the arms in Brown Staz-On on the front of the plastic card. BE CAREFUL, it is slippery. Try not to let the stamp slide around when pressing down. This was a fun card to make - worth all the time it took. :) I hope you liked it, too.